I’m sure this post is no surprise to many of you as I like to wear winged liner in about 70% of my tutorials. I do love the no liner eyelash look, but my hand can’t help but reach for the liquid liner really often. My younger self would be shocked at my mastery of a once difficult cat eye technique. This tutorial is for a more bold winged liner; specifically the look I use with no other eyeshadow and a bold lip. Read on for my techniques! I’ve been experimenting with a new technique to apply my winged eyeliner as of late. I was inspired by Samantha Chapman of Pixiwoo, who did a tutorial on winged eyeliner for women with hooded eyes. For us hooded eyelid gals the winged eyeliner look is sometimes hidden because of how our eyes look when open. This technique is perfect for mastering that look and making things cool and artsy at the same time! I started off the look with two lines where I want the wings to go. I followed the angle of my lower eyelid to draw these lines. As you can notice, my lines are not perfectly symmetrical and my wings won’t be either. I’ve done better at times, but we can’t expect our makeup to be perfect every time. Things won’t always match so remember, our eyes are sisters not twins. Next I lined along my lash-line and thickened the line along the whole eye. Thickening helps prep you for the hooded eyes step. If you don’t have hooded eyes you can even stop here! This final step is what helps the hooded eyelid ladies. Keep you eyes open as you would normally so you know what the line will look like. Then draw your liner straight across from the tip of the wing to the line along your lash-line. If done correctly you will have a bold wing with eyes open and a bit of a flick on the end with your eyes closed. You can connect the flick if you want, but I never do because I think it looks cool. My flick has been more prominent depending on how good I do on a given day, but here’s a better picture of how the wing looks. As you can see, there is a bit of gap in the line that looks pretty rockin’ if you ask me! Finally I used a bold red lip to complete the look. 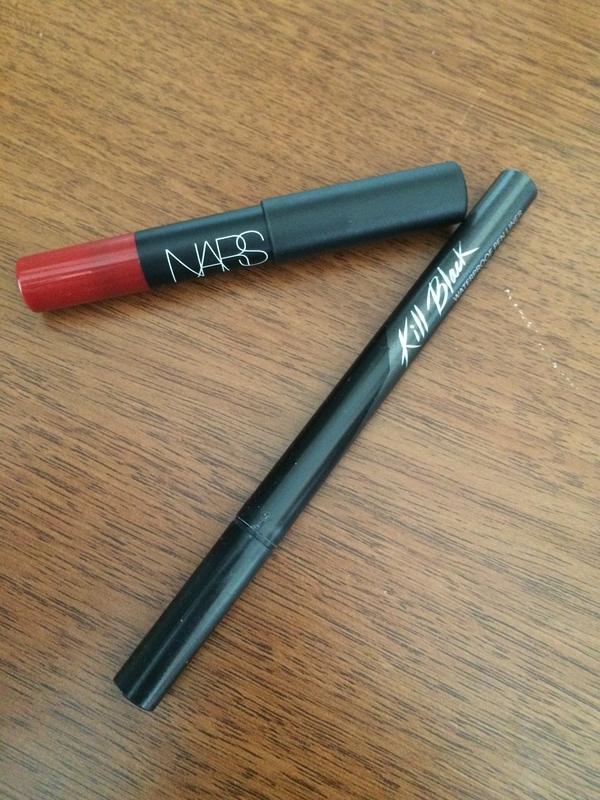 I used the NARS Velvet Matte Lip Pencil in Cruella. This is the classic winged liner lipstick, but I use this look with any bold lip for any season. I tend to pair it with bright pinks in the summer and dark plums in the winter. I also added a decent amount of blush to make sure my face had some life. Check out the finished look below! This entry was posted in Tutorial and tagged bold winged eyeliner tutorial, classic winged eyeliner, winged eyeliner tutorial. Bookmark the permalink.